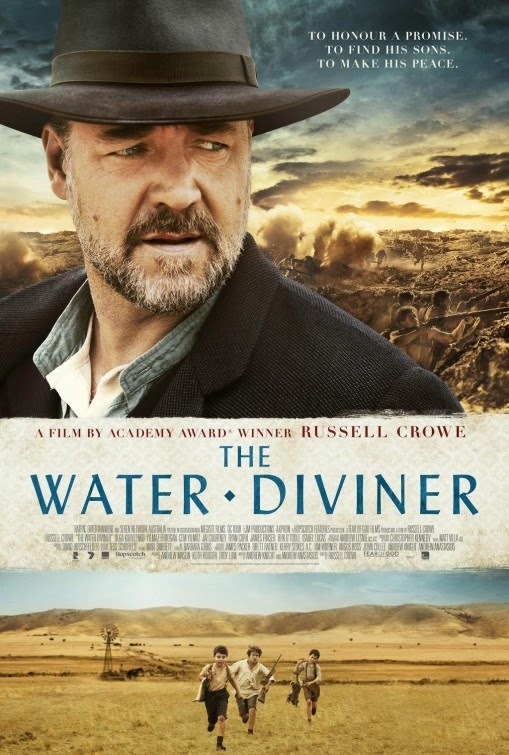 Russell Crowe's film THE WATER DIVINER arrives just in time for the April 25 centenary of Anzac Day, the commemoration of the landing of the ANZAC (Australian and New Zealand Army Corps) forces at Gallipoli, where they battled the Ottoman Empire in World War I. The Gallipoli (or Dardanelles) Campaign, one of the war's bloodiest, cost the lives of nearly a half-million men. The largest number of those killed were Turks, but many thousands were English, French, Australian and New Zealander. As he reads aloud from the boys' favorite book, a wider shot reveals that the beds are empty. The boys, who enthusiastically joined the army to fight “for God and country,” are missing and presumed dead. Eliza, half-mad with grief, chides Connor for not finding their sons. “You can find water, but you can't even find your own children.” She drowns herself, and Connor vows at her grave to bring the boys back to be buried beside her. Denied a permit by the British consul to travel to Gallipoli, Connor bribes a fisherman to take him there by boat. In Gallipoli, the ANZACs are carrying out the gruesome task of burying the many dead, and civilians are banned from the area. Turkish officer Major Hasan (Yulmaz Erdogan), noting that he's the only father who came looking for his sons, persuades the ANZAC captain to help him with his search. Connor's divining skills lead him to the battlefield site where his sons' bones lie, bearing evidence of execution. Only two sons' bodies are there, however, and Connor learns that Arthur, the eldest, may have been taken prisoner. Connor's journey continues, and he becomes involved in the problems of Aysha, who has not told her son his father is dead, and who is being pressed to marry her stern brother-in-law, Omer. Crowe gives a nice, quietly emotional performance in a story interwoven with flashbacks of the boys' adventurous youth and harrowing battle scenes, rendered with arresting, amber-hued cinematography by Andrew Lesnie. The scenes depicting the young brothers' death throes on the battlefield is particularly unforgettable. The film has the quality of a fable, so it's perhaps forgivable that it indulges in some hoary tropes (the clever “Gunga Din” boy, the beautiful war widow) and outlandish Indiana Jones-style heroics involving a cricket bat. It would have been nice, I think, if the writers had given more substance to Connor's divining ability. This rare talent helps him find his sons and should have been, considering the film's title, a bigger part of the story. I was reminded of the renowned Dutch clairvoyant Marinus Dykshoorn, who used a divining rod to help authorities locate numerous missing bodies. The film has been embraced in Turkey, in part because of its even-handed treatment of the historic events and its sympathetic view of Turks as victims of ill-fated Western machinations. 3 out of 4 stars.